Summary and Definition: The Narragansett tribe inhabited Narragansett Bay, that was named for the tribe, and western Rhode Island. The Narragansett tribe were farmers, hunters and expert fishers who travelled in their canoes around the islands of Narragansett Bay and along the Providence and Pawcatuck Rivers. The name of the most famous chief of the Narragansett tribe was Canonicus who sold land in Rhode Island to Roger Williams. What language did the Narragansett tribe speak? The Narragansett tribe spoke in a related dialect of the Algonquian language family. The meaning of the name 'Narragansett' is "People of the small point" in respect of the location of their homelands. What was the lifestyle and culture of the Narragansett tribe? The Narragansett tribe were a large, strong warlike people who inhabited nearly all of present Rhode Island and parts of Massachusetts, numbering over 10,000 warriors. The Narragansett people organized were highly organized with a grand sachem (chief) and eight lower ranking hereditary sachems who usually resided in the largest winter village of longhouses. The were expert farmers who raised large fields of corn, beans, and squash. The Narragansett people avoided the first diseases brought to North America by the Europeans but lost many of their people to smallpox in 1633. 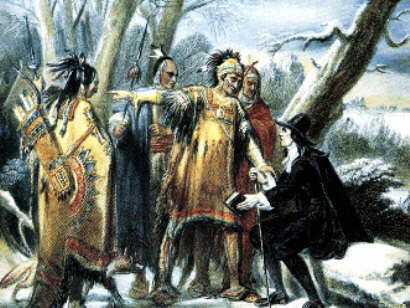 They were at first were hostile to the newcomers but Chief Canonicus was more friendly towards the Europeans and sold land in Rhode Island to the dissident colonist Roger Williams. Conflict between the two cultures was, however, inevitable as the British made further encroachments on their lands and tried to convert the people to Christianity and establishing the 'Praying towns'. The Pequot War (1634-1638) was followed by conflict with the Mohegan tribe over Pequot lands and the Narragansett then became involved in King Philip's War and were subjected to massacres by the British. By 1682 less than 500 Narragansett people remained. Where did the Narragansett tribe live? The Narragansett are people of the Northeast Woodland Native American cultural group. The geography of the region in which they lived dictated the lifestyle and culture of the Narragansett tribe. What did the Narragansett tribe live in? The Narragansett tribe lived in temporary summer lodges called a wetu aka wigwam. These were small cone-shaped selters with an arched roof built using a wooden frame from saplings (young trees) that were covered with sheets of birchbark. Wide sheets of bark from large, older trees covered the frames of the wigwams, which were held in place by ropes. These summer wigwams were covered with woven mats made from tall cattail plants. Their permanent winter lodges were in fortified villages of longhouses, which were also built using birchbark. What food did the Narragansett tribe eat? The food that the Narragansett tribe ate included included the staple crops called the "three sisters" which were corn, beans and squash. These crops were supplements with berries, nuts fruits, Jerusalem artichokes, pumpkins, and zucchini. Meat included deer (venison), black bear, rabbit, squirrel, duck, grouse, geese, muskrat, beaver, otter, raccoon and turkey. Fish included haddock, salmon, cod, flounder and mackerel. Shellfish was readily available and included oysters, clams, lobsters and scallops. Nuts, berries and grapes were also important food source to the Narragansett. What weapons did the Narragansett use? The weapons used by the Narragansett included war clubs, tomahawks, battle hammers, knives, bows and arrows, spears and axes. Their enemies were the Wampanoag tribe. What clothes did the Narragansett wear? Before the Europeans traded cloth with the Native Indians the vast majority of clothes worn by the Narragansett were made from animal skins or birchbark. The animal skins include deer (buckskin) raccoon, beaver, otter and moose. The garments included long breechclouts, leggings, long cloaks and shorter shoulder to waist length mantles. Narragansett women wore wraparound skirts, dresses and warm buckskin cloaks during the winter. Their moccasins were made of one piece of hide with a long tongue and a high collar that could be left up or folded down. Belts were woven from dogbane and other plant fibers that were colored with vegetable dyes. Their headdresses consisted of a woven headband and topped with feathers as a sign of status. What was the religion and beliefs of the Narragansett tribe? The Green Corn Festival was one of the most important ceremonies of the Northeast Woodland Indians, including the Narragansett, when corn was presented as a sacred offering to the Great Spirit. Narragansett History: What happened to the Narragansett tribe? The following Narragansett history timeline details facts, dates and famous landmarks of the people. The Narragansett timeline explains what happened to the people of their tribe. 1646: 'Praying towns' were developed by the Puritans of New England (1646 - 1675) in an effort to convert Native Indian tribes to Christianity.